South Korea's national security director Chung Eui-yong, right, and National Intelligence Service Chief Suh Hoon, left, talk before boarding an aircraft as they leave for Pyongyang at a military airport in Seongnam, south of Seoul, March 5, 2018. South Korean envoys briefed American officials on Thursday on their unprecedented meeting with North Korean leader Kim Jong Un, while the U.S. secretary of state said that though “talks about talks” might be possible with Pyongyang, denuclearization negotiations were likely a long way off. South Korea’s National Security Office head Chung Eui-yong and National Intelligence Service chief Suh Hoon flew to Washington where they were expected to explain North Korea’s stance on possible future talks with Washington and the prospect of Pyongyang suspending nuclear tests if the security of the North's government is assured. Chung, who led a South Korean delegation for a first-ever meeting with Kim on Monday, met U.S. National Security Adviser H.R. McMaster at the White House, beginning a round of discussions with senior administration officials. A South Korean official said President Donald Trump or Vice President Mike Pence might also join in. 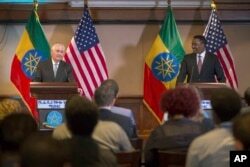 US Secretary of State Rex Tillerson, left, addresses the media after his meeting with Ethiopian Foreign Minister Dr. Workneh Gebeyehu at a joint press conference in Addis Ababa, Ethiopia, March 8, 2018. Speaking during a trip to Ethiopia, Secretary of State Rex Tillerson said South Korea was keeping the United States “well informed,” but suggested actual negotiations between Washington and Pyongyang were a ways off. “In terms of direct talks with the United States ... we’re a long ways from negotiations,” Tillerson told a news conference in Addis Ababa. Tillerson also reiterated previous calls for African states to cut ties with North Korea. Pyongyang has more than a dozen embassies on the continent, and the Trump administration has said it earns hard currency from arms deals with African governments and trafficking wildlife parts from Africa. Monday’s meeting with Kim Jong Un was the culmination of a series of North-South contacts that have helped ease fears of war in a standoff over Pyongyang’s development of nuclear missiles capable of hitting the United States. In another sign of lingering tensions, the two Koreas will not march together at the opening ceremony of the Winter Paralympics, as they did at the Olympics last month in South Korea, because they cannot agree on a united flag that erases islands disputed with Japan, officials said. Tensions over North Korea rose to their highest in years in 2017, and the Trump administration has warned that all options are on the table, including military ones, in dealing with Pyongyang, which has pursued its weapons programs in defiance of ever tougher U.N. sanctions. A senior U.S. administration official said no decision on the possibility of the United States joining a summit of North and South Korea was expected to be made at the meeting with McMaster. Those discussions would be conducted in private among U.S. officials, the source said.